150 businesses representing over 20% of the global plastic packaging market have now agreed to start building a circular economy for plastics with the Ellen MacArthur Foundation. Create a circular economy in plastic by significantly increasing the volumes of plastic reused or recycled into new packaging. Encouragingly, over 100 companies in the consumer packaging and retail sector have now committed to making 100% of their plastic packaging reusable, recyclable, or compostable by 2025. “The industry needs to tackle this ocean waste and develop ways to reuse plastics. There are no deniers out there that we have a plastics-waste issue. The challenge is that the plastics industry has developed around a linear value-chain. A line connects the hydrocarbons from the wellhead to either the environment or to landfills once consumers discard them. The discarded plastic does not re-enter the chain. The Winners will be those companies who focus on the emerging opportunity to eliminate the physical and financial waste created by single use packaging. As the European Commission has noted, it is absurd that only 5% of the value of plastic packaging is currently retained in the EU economy after a single use, at a cost of €70bn-€105bn annually. On a global scale, this waste is simply unaffordable, as the UN Environment Assembly confirmed on Friday when voting to “significantly reduce” the volume of single-use plastics by 2030. The plastics industry now finds itself in the position of the chlorine industry 30 years’ ago, over the impact of CFCs on the ozone layer. The Winners will grasp the opportunity to start building a more circular economy. The Losers will risk going out of business as their licence to operate is challenged. My new analysis for iCIS Chemical Business highlights the paradigm shift now underway in the plastics industry. A paradigm shift is underway in the plastics industry as public concern mounts over the impact of plastic waste on the oceans and the environment. For 30 years, plastics producers have primarily focused upstream on securing cost-competitive feedstock supply. Now, almost overnight, they find themselves being forced by consumers, legislators and brand owners to refocus downstream on the sustainability agenda. It is a dramatic shift, and one which is likely to create Winners and Losers over a relatively short space of time. The pace of change is startling. 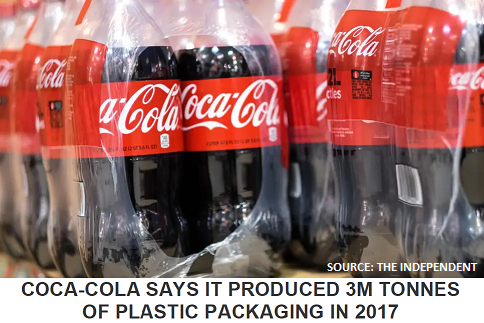 In January, 11 major brands, including Coca Cola, Unilever, Wal-Mart and Pepsi (and since joined by Nestlé) announced they were committed to working towards using “100% reusable, recyclable or compostable packaging by 2025“. Then in April, a UK government-led initiative saw 42 companies, responsible for over 80% of the plastics packaging sold in UK supermarkets, promise to “transform the plastic packaging system and keep plastic in the economy and out of the ocean”. Tesco, the UK’s largest retailer, added to the pressure by beginning the move to a “closed loop system”. Clearly seeing the issue as a source of potential competitive advantage, they announced plans to remove all “hard to recycle” plastics – such as polystyrene, PVC and water-soluble bio-plastics – by the end of next year. Then last month, the EU Commission adopted new rules that will mean a minimum of 50% of all plastic packaging waste will be recycled by 2025. In addition, it has proposed drastic action, including bans, to reduce the use of the top 10 single-use plastic items found on EU beaches by 2021. Understandably, many companies and CEOs have failed to keep up with these developments. Others have simply ignored them on the assumption they will prove to be all talk and no action. But nobody who attended the Circular Economy Forum at the recent ICIS World Polyolefins Conference could have come away believing that “business as usual” was a viable option for the future. As Borealis, Europe’s second largest polyolefin producer, explained, their vision is instead to “establish plastic waste as just another standard feedstock as the new normal” for the industry. As the second chart shows, major plastics including polyethylene and polypropylene are now under major threat. 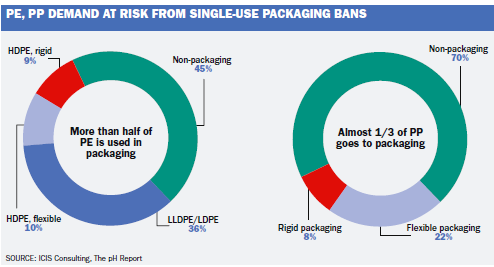 More than 50% of PE demand, and nearly a third of PP demand goes into single use packaging. 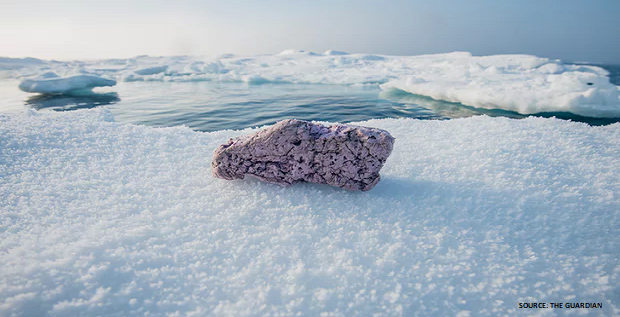 Following the World Economic Forum’s ‘New Plastic Economy’ report in 2016, and Sir David Attenborough’s ‘Blue Planet 2’ series for the BBC, it is clear that this application is under major threat. Paradigm shifts generally produce winners and losers. In this case, the winners will be those plastics producers who adapt to the new opportunity created by the need to produce recycled plastic. 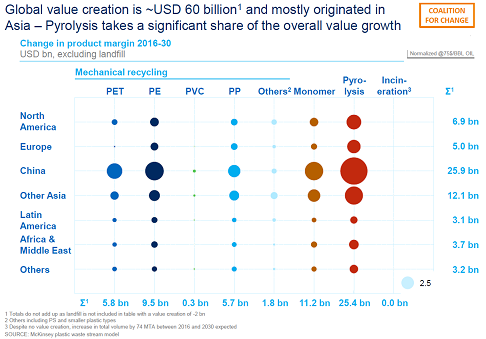 This will clearly require investment in recycling facilities, but the sums involved are small compared to the cost of building new olefin crackers or refinery capacity. And in many countries, producers can even expect to be paid to take the recycled plastic as a feedstock, when the alternative is the cost of sending it to landfill. The International Energy Agency will also need to revisit its assumptions about future demand growth as the impact of the new paradigm becomes more apparent. As National Geographic has reported, the world has produced around 8.3 billion tonnes of plastic over the past 60 years, and only 9 per cent of this has been recycled. This is a shocking waste of a valuable resource. The paradigm shift now underway is well overdue and should prove very profitable for those companies prepared to seize the opportunities it creates. Please click here if you would like to download the article. The post Plastics recycling paradigm shift will create Winners and Losers appeared first on Chemicals & The Economy. We also know how this story will end, because we have seen it played out many times over the past 75 years. As the photo on the left shows from 1953, most major Western cities used to be covered in smog during the winter, with people routinely wearing masks to try and protect themselves. The same is still true today in China and many cities in the Emerging Markets, as the photo on the right confirms. Smart companies and investors in the plastics industry already know “business as usual” strategies are no longer viable. Instead, they are starting to map out the enormous opportunities that these changes will create. The issue is simply that plastic waste is no longer just seen as being unsightly. It is now recognised as a major environmental hazard. 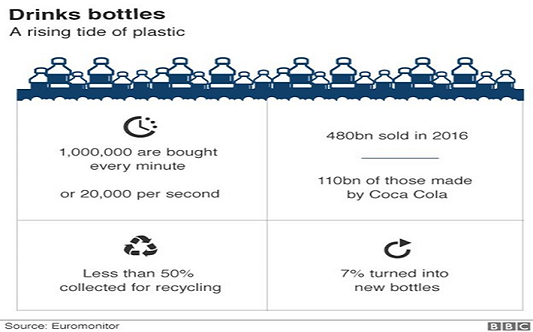 As the 3rd chart shows, 480bn plastic bottles were sold in 2016 around the world, but only 7% were recycled. This waste is becoming unacceptable to public opinion. As a result, the UK government is now considering a tax or ban on all single use items. 2012. Time to stop making single-use plastic bags? Globalisation was the great trend of the past 30 years, and it changed the world very profoundly. Today, the focus is on sustainability and the development of the circular economy. It is an exciting time for people who want to solve the problem of plastics pollution by thinking “out of the box”, and developing the more service-driven businesses of the future. The post Sustainability now the key driver for plastics industry profits appeared first on Chemicals & The Economy.